Several years ago, while writing a philosophy dissertation about moral saints and drinking ungodly quantities of coffee at night, I came across two real-life stories that ended up having a profound effect on me. I found these stories in A Common Humanity, by the Australian philosopher, Raimond Gaita. Each story is merely one paragraph long, and describes only a tiny moment in the lives of two very different people. So much has changed in my life since I first read that book by Gaita. Back then, I was living in Phoenix, Arizona, and my daughter was only three years old. I was hopeful about finding an academic job, and Arizona hummingbirds had a habit of balancing themselves charmingly right outside my office window, as if asking me questions I wanted to answer. I’m living in Seattle now, and my sweet daughter is nine years old. I started writing poetry recently. I never finished my dissertation, and I do not have an academic job — or even, right now, a job — and Seattle crows rudely drop down from the sky searching for something they know not what, or else, they complain. But the two stories I’m about to tell you remain with me, close to me, unable to close somewhere inside of me, and I find myself thinking about these stories almost every day. the grief of Vietnamese women whose children were killed in bombing raids. less as we replace dead pets. I imagine M in a small room with bookshelves, in an armchair with a footrest, watching TV. I can hear her uttering, “But it is different for them,” and the way she keeps her eyes on the TV as she speaks, the way she waves her hands in a gesture that bespeaks, “The topic is exhausted.” And does she then simply change the channel or get up to make a fresh cup of coffee? Or does she say nothing else, sinking deeper into her own grief, unimaginable in its own right? And what did Gaita say to her? What would I say to her? I thought of M while reading a poem by Matthew Olzmann, titled “Imaginary Shotguns.” Olzmann dedicated this poem to Jordan Davis (and many other kids like him), a 17-year-old high school student who was shot in “self-defense” by a Florida man, Michael David Dunn, in 2012. “There’s a kid with an imaginary shotgun, / and the men who claim to see it will return with real guns,” Olzmann writes. In this beautiful, moving poem, young African-American men go about their lives hoping “the night sky is glorious, and the birds / are really singing,” not realizing that other people imagine them hiding shotguns and posing continuous threat. To me, this poem brought to mind how a sentiment “but it is different for them” can also cause fear, leading to supposedly justified suspicions and violence. Why do imaginary shotguns exist? Because there is a widespread perception that young black males live in a world where violence is normal, and harming someone else is no big deal, and maybe, the sentiment follows, young black males simply don’t value life the way we do. “That’s just how they are,” I can hear someone saying (I did in fact hear someone say this once), waving her hand like M did. So, then, within this realm of reality, of course the Jordan Davis’s of this world are imagined with shotguns and of course those who “defend” themselves feel fully justified in their actions. It is hardly surprising that in states with Stand Your Ground laws (as in Jordan Davis’s case), white defendants are much more likely to be found “justified” in court for killing a black “attacker,” as opposed to a white one. Whenever I think of M and imagine her waving her hand dismissively as she says, “But it is different for them,” I wonder what I can do to make sure I don’t ever wave my own hand at anyone from somewhere in the depths of my heart. I know what the philosophers have been telling us to do: to read as much literature as possible and especially literature written by writers and poets from diverse backgrounds. There is a long-standing view found, for example, in the writings of Martha Nussbaum and Richard Rorty, that literature, and especially the novel, can help us develop better moral imagination and moral sensitivity. And so, let’s read widely to imagine better. Let’s read to glimpse different inner worlds, self-conceptions, values, childhood memories, family photo albums, first loves, beloved places, secrets that haunt. Pain in every conceivable shade of blue. Yet, despite these patients’ dire conditions, there was a group of psychiatrists at the ward who devoted themselves to improving the lives of those patients. Their decency and their determination to help greatly impressed young Gaita. These psychiatrists “spoke, against all appearances, of the inalienable dignity of even these patients.” It impressed me too. Imagine them! Imagine their sincerity, their efforts to change protocols, their clean white coats and open smiles! help them; but she also revealed that in our hearts we did not believe this. the name we give to such behavior. Gaita’s nun is a wonder. How had her demeanor revealed the dignity of these patients? How did she do it? Was it the gentle look in her eyes? The way her hand touched their hands? The way she smiled? And what exactly did she reveal? Imagine being in that room with her, standing next to Gaita, maybe holding a cup of coffee, feeling the effects of that revelation. Are you now experiencing a rational realization about the dignity of all human beings, a realization similar to “all human beings are mortal/therefore I’m mortal”? Gaita writes that the nun had revealed the humanity of these patients through the purity of her love. Her love proved the reality of their dignity and proved, too, that their dignity requires us to reach out without condescension. So does a tiny bird, then, continue to live inside each of us well into old age? My daughter’s bird is a green parakeet with a sharp blue tail and a warm little body (warm like a tiny oven) that pulses and pulses, endlessly it seems, pulses as if its only organ is a heart, as if trying to prove that all living hearts are made for flight. This little bird — is it akin to that mysterious soul we all have, that brute, rudimentary, warm, pulsing “I-am-here-I-am-here!” of our experiences? Is this what the nun revealed? And does it matter if the bird inside me or you or anyone is deep or shallow, so long as it flutters, so long as it sings, so long as someone notices its magic and sings in return? 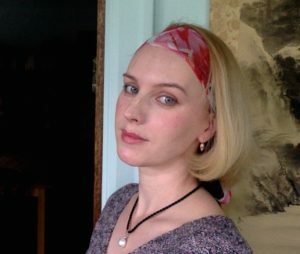 Svetlana Beggs’ poems and stories have recently appeared or are forthcoming in CALYX Journal, Hayden’s Ferry Review, New Orleans Review, Pleiades, Cleaver Magazine and elsewhere. A native of St. Petersburg, Russia, she lives in Seattle.